This is a pair of snowshoes, not the kit. Redfeather Hike snowshoes feature a Live Action Hinge that lifts the tail of the snowshoe with every step. So if you were concerned about having to drag your tail through the snow, don't be. That basically makes you faster than a speeding bullet, and able to leap tall buildings in a single bound (Pretty much). 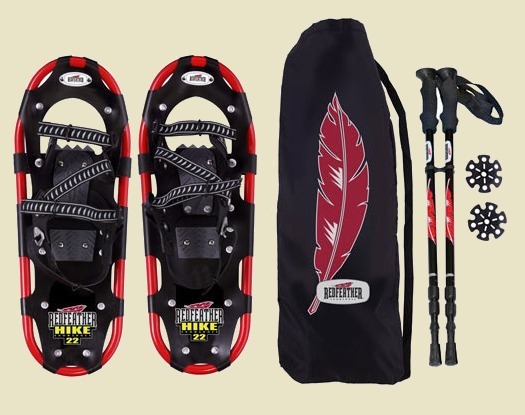 The Redfeather Hike is simply a superior design that ensures flotation over the snow, stability, speed and mobility. Available in a variety of sizes including narrower sizes for women that allow for a purely natural stride. The Redfeather Hike is as close to a custom snowshoe as any recreational snowshoer could hope for. 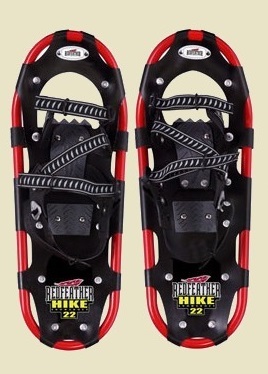 Control Bindings: A rugged, secure binding which features a solid polymer heel plate, semi-rigid injection molded polyurethane toe and heel frames for superior lateral support, quick-adjust nylon webbing to secure foot in frames and flexible urethane heel strap which stretches to hold heel of boot securely. Hinge: Live-Action Hinge lifts the tail of the shoe from the snow with every step for added mobility and speed. Frame: 6000 Series Aircraft Grade Aluminum. Western Round Tail design for maximum flotation. Crampon: Sure Grip crampon system with stainless steel front and rear crampons for stability. Powder coated to shed snow and ice. Decking: TX 35 Rip Stop - Superior puncture and abrasion resistant material that stays soft in sub zero temperatures. note; Hike 25 is silver/black, Hike 30 and Hike 36 are red/black. Redfeather Hike features a Live Action Hinge that lifts the tail of the snowshoe with every step. So if you were concerned about having to drag your tail through the snow, don't be. That basically makes you faster than a speeding bullet, and able to leap tall buildings in a single bound (Pretty much). The Redfeather Hike is simply a superior design that ensures flotation over the snow, stability, speed and mobility. Available in a variety of sizes including narrower sizes for women that allow for a purely natural stride. The Redfeather Hike is as close to a custom snowshoe as any recreational snowshoer could hope for. KIT INCLUDES: one pair snowshoes, 3 section trekking poles and a tote bag to keep it all together. Our toboggans are 'Made in USA' right in Brattleboro, Vermont. Manufactured to superior standards out of 5/16" thick steam-bent local hardwoods. The edge and center slats are stained with contrasting mahogany or red stain to provide a classic look. A generous coating of gloss finish ensures excellent durability and a lifetime of fun in the snow. Shipping available to 48 States only. Size: 6ft... Length; 72" width; 16.5"
Red vinyl pad NOT included. Includes deluxe red vinyl pad ! !